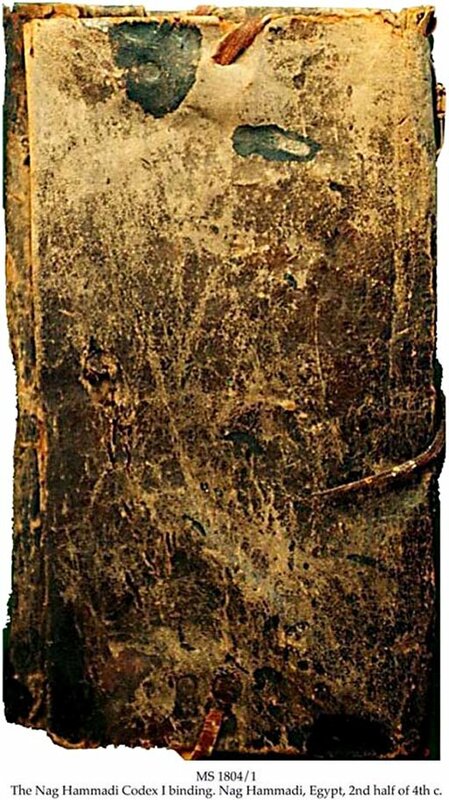 Description	 Nag Hammadi, Egypt, 2nd half of 4th c., sheep leather, stained brown on the hair side, size 30x15 cm closed, made from one piece of leather, 34x43-45 cm. Flap of the outer edge of upper cover 30x7 cm, to be folded around the edge of the codex with a strap (now gone) to be wrapped around the binding several times. Straps at the middle of the top and bottom of both covers to be tied when closed. The inside was lined with 4-6 layers of papyrus as cartonnage. Leather strips, 1-3 cm wide, were folded in and pasted down over the cartonnage. Along the edge extended to the flap, a strip of 30x2-3 cm was added in place of a fold. The whole was covered with papyrus pastedown. 2 leather stays, 7x2-3 cm, to protect the inside of the papyrus quire fold, and the 2 thongs are preserved. The thongs passed through the stays, the quire, the cartonnage and the leather, 2, 6, 24 and 28 cm from the top of the spine to be knotted outside the spine. 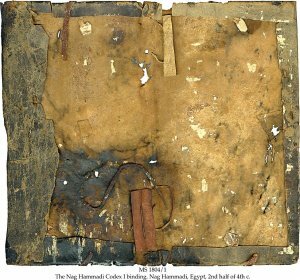 Context	 The cartonnage, 49 inscribed and 183 uninscribed papyrus fragments, is MSS 1804/2-6. The lid of the jar that contained the Nag Hammadi library is MS 1804/7. 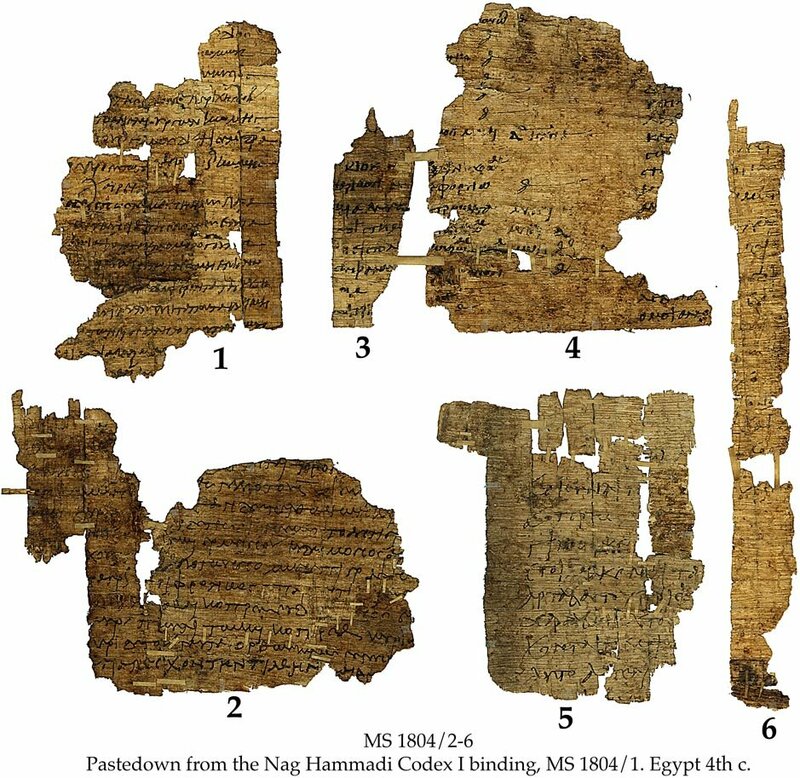 The papyrus codex contained in the binding, 70 ff., 30x14 cm, is now in the Coptic Museum, Cairo, known as Nag Hammadi Codex I, or the Jung Codex. It contains 5 important Gnostic texts, including "The Gospel of Truth". 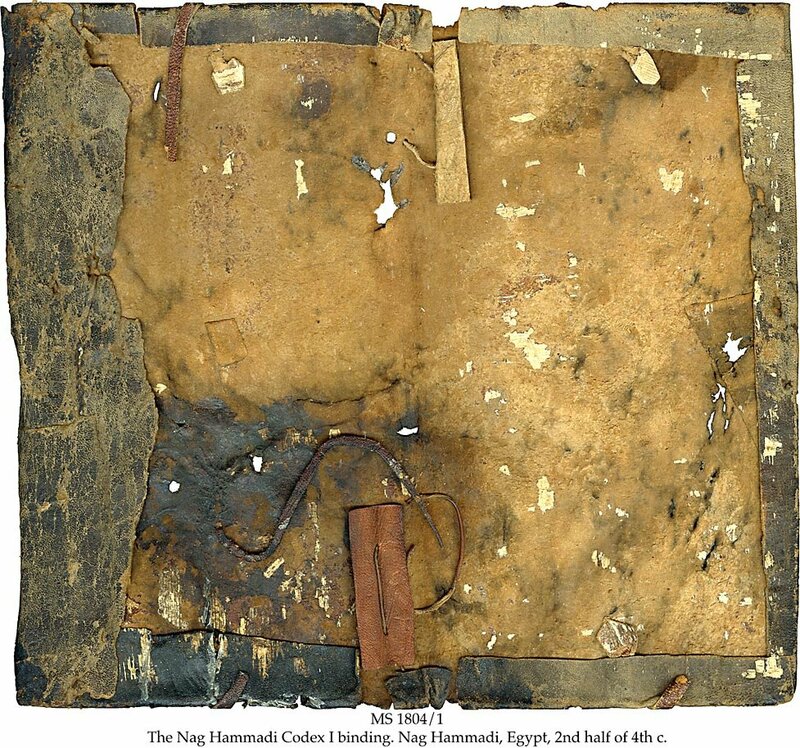 The remaining codices of the Nag Hammadi library are also in the Coptic Museum, Cairo, apart from a half leaf in Yale: Beinecke Library. The present binding with its cartonnage is the only part of it in private ownership. The library consists of a fragment of 8 leaves and 12 codices, 11 with their original bindings. All together there are 52 texts, of which 40 were previously unknown, all copied in the 4th c., originally after exemplars in Bibliotheca Alexandrina, Alexandria. The present binding is identical in construction with the bindings of codices: VI and X.
Provenance	 1. A Gnostic community or possibly the Pachomian monastery of St. Palamon at Chenoboskeia, near Nag Hammadi (2nd half of 4th c. - ca. 400); 2. Buried in a jar in the sand and rock on the talus of the cliffs of Jabal al-Tarif (ca. 400-1945); .3. Mohammad and Khalifah Ali, al-Qasr (ancient Chenoboskeia) (1945); 4. Nashid Bisadah, Nag Hammadi (1946); 5. Nashid Bisadah and Masud Iskarus (jointly), Nag Hammadi (1946-1948); 6. Tawfiq, Cairo (1948); 7. Albert Eid, Cairo and Bruxelles (1948-1949); 8. Private collector and his heir, France (1949-1972); 9. The Institute for Antiquity and Christianity at The Claremont Graduate School, Claremont, California (1973-1994). Commentary	 The Nag Hammadi library can be said to be among the 3-5 most important MS finds in the 20th c. It is as important for Gnostic thinking and Christianity (unknown Gospels and sayings of Jesus) as the Dead Sea Scrolls are for the Old Testament and Judaism, the Dishna hoard of the Bodmer papyri for the New Testament, or the Oxyrhynchus papyri for classical literature. It also about doubled the known examples of intact Coptic bindings of the Roman period. Leather bindings of the 4th c., including the present one, are the oldest known. All except the present binding are in public institutions. Published	 The binding is published in: The Facsimile Edition of the Nag Hammadi Codices, Codex I, Leiden, E.J. Brill, 1977. A general discussion of all the bindings in: The Facsimile Edition of the Nag Hammadi Codices, Introduction, pp. 71-86, Leiden, E.J. Brill, 1984, and in Jean Doresse: Les reliures des manuscrits gnostiques coptes découverts a Khénoboskion, Revue d'égyptologie, tome 13, Paris 1961 pp. 27-49. Exhibited	 1. Conference of European National Librarians, Oslo. Sept. 1994. 2. "Preservation for access: Originals and copies". On the occasion of the 1st International Memory of the World Conference, organized by the Norwegian Commission for UNESCO and the National Library of Norway, at the Astrup Fearnley Museum of Modern Art, Oslo, 3 June - 14 July 1996. MS 2080, Blindstamped pigskin binding, Syria, ca. 10th c.